In this game of Double Exposure Blackjack, the dealer always hits on soft 17. Splitting is allowed, and you can te-split twice. You can even re-split aces, but afterwards, you just get one more draw on each ace then you must stand. Drawing a 10 point card on a split ace counts as 21, not blackjack. You can double down on your initial cards when they total 9, 10, or 11 – the doubling down bet must match your initial bet. You can double down after a split, but not after blackjack. You win tied blackjack, but the dealer wins all other ties – there is no push in Double Exposure Blackjack. There is also no option for late surrender. Minimum bet in Double Exposure Blackjack Gold is 1, and maximum bet is 500 (USD/GBP/Euro). Wagers are made with one of 10 different chip sizes, so you can always bet exactly how much you want. Winning a hand without blackjack pays at 1:1, and because you get to see the dealer’s cards, blackjack also pays at 1:1. Insurance pays out at 2:1, but does not cover any second hands after a split, or any hand after a double down. Any good Blackjack game should be visually impressive, yet subtle enough to let the game just slide on by without drawing your attention away from what is really important – your strategy. Double Exposure Blackjack does just that. Its graphics are realistic, its gameplay is smooth and subtle, and in the end, everything just works like it should. The cards are large and easy to read, and so are the chips. The only possible complaint is that the interface takes a couple of minutes to learn – but that is to be expected, right? 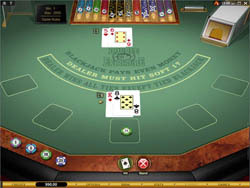 Double Exposure Blackjack Gold version offers realistic graphics, with a variety of wonderful animations from spinning chips to flipping cards built right in. The only possible drawback is that the interface is a but unusual – the primary buttons pop up when you need them, which is great, but the others are small and hard to read at the bottom. A small price to pay! Playing Double Exposure Blackjack can be a bit tricky, since the dealer wins all ties (except blackjack ties which go to the player). This means that if you see the dealer has 20, then you have to get 21 to win, since 20 won’t push. This narrows things down for you a bit, by making strategy a little different. Keep an eye on the built-in strategy table for some good advice. Also, remember that Blackjack only plays 1:1 in this game, so it doesn’t matter how you beat the dealer, you are always paid out the same for it! This is an interesting, and subtly different game of blackjack for those who are looking for something fresh and exciting. The gameplay changes a lot with these little rule adjustments, and this cannot be played like a standard blackjack game. Be aware of these differences, and enjoy this fun, and interesting, variation of the classic game!